In this day and age, theme park guests of all types want to be online and ready to share photos, videos, and the thrills of their vacation. 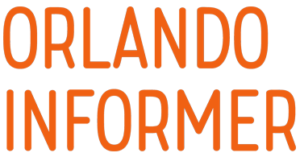 We don’t blame you – after all, Orlando Informer is on many social networks ourselves, including Twitter, Facebook, and Instagram. 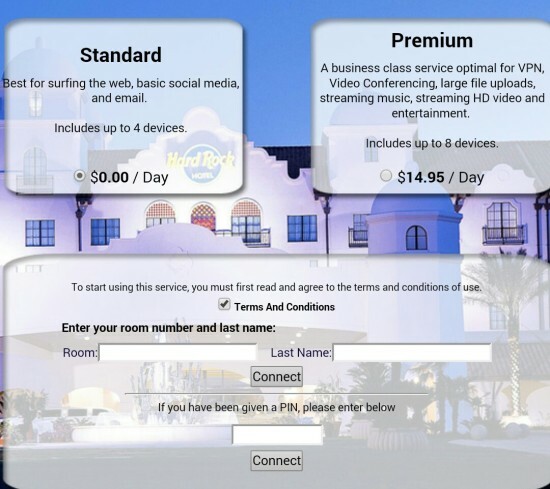 On this page, we’ll discuss everything you need to know about free internet access throughout Universal’s parks and its on-site hotels. 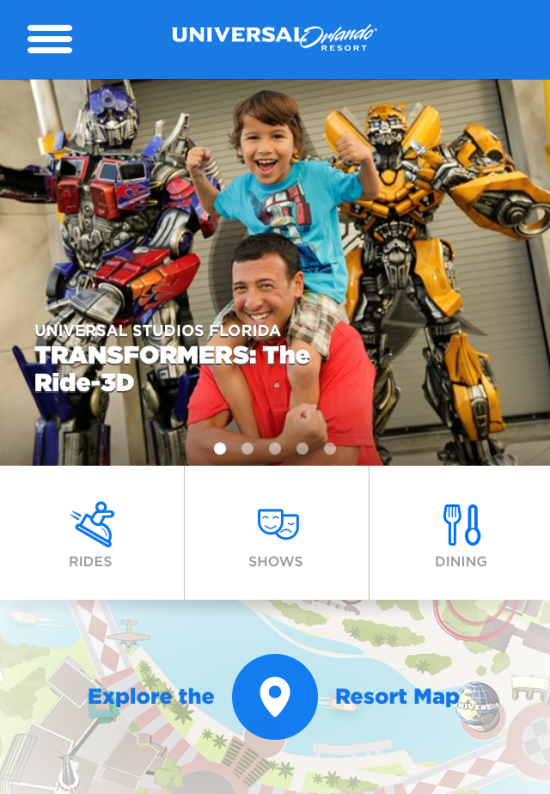 We also provide an introduction to the official Universal Orlando mobile app. Universal Orlando has expanded its complimentary wifi network to include Universal Studios Florida, Islands of Adventure, and Volcano Bay, as well as (almost all of) Universal CityWalk. The wifi is sponsored by Xfinity Internet. The sign-on process is simple. Just search for the wifi network “Universal.” Once the network is found, you will be asked if you are an Xfinity customer. If so, log in using your existing Xfinity account information. If you are not an Xfinity customer, you will need to provide your email address and zip code. In order to join the network, you must agree to the terms and conditions (including that, by using the network, you agree to receive promotional emails from Universal) and agree that you are 18 years of age or older. 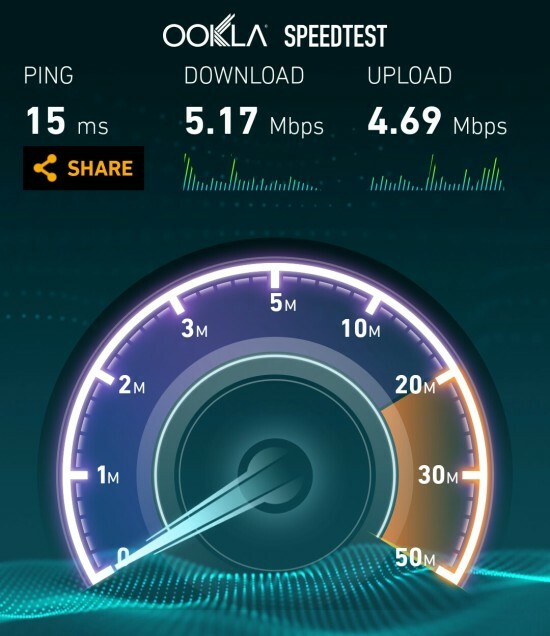 Overall, speeds are good for basic use, and access has been strong throughout the parks and most of CityWalk. Comparing the two theme parks, the signal tends to be slightly stronger in Universal Studios Florida as compared to Islands of Adventure. Usually, you can connect to the Xfinity wifi network the moment you get past the security checkpoint and moving walkways of Universal’s parking structure. Volcano Bay, meanwhile, is fairly comparable to Islands of Adventure. The connection may log-off due to inactivity. If this happens, simply open up your wifi settings and look for the “Universal” network again. If you have already logged in once during the same day, you should not have to re-enter your log-in information. 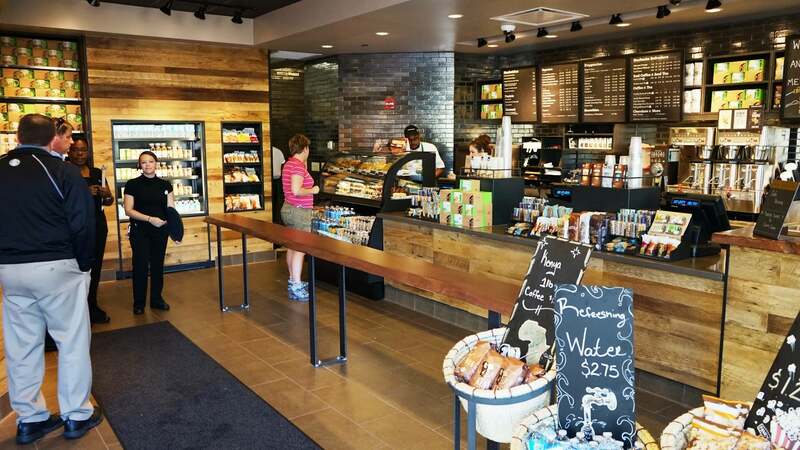 Besides the free Xfinity-sponsored wifi, there is free internet available at the Starbucks locations at CityWalk and inside Universal Studios Florida and Islands of Adventure. This is a good option if, for any reason, you have difficulty with the Xfinity service. Additionally, some CityWalk restaurants also offer free wifi to their patrons, such as Hard Rock Cafe. Just ask your server for the password. If you’re not a registered guest but still want to get online, you’re in luck – Universal’s on-site hotels offer free wifi access to everyone in their lobbies and pool areas (just don’t expect too much performance). Here are the links to the app: Android or iOS. The official app can help with planning your vacation before you arrive, but most of its functions are best used when you are actually in the parks. 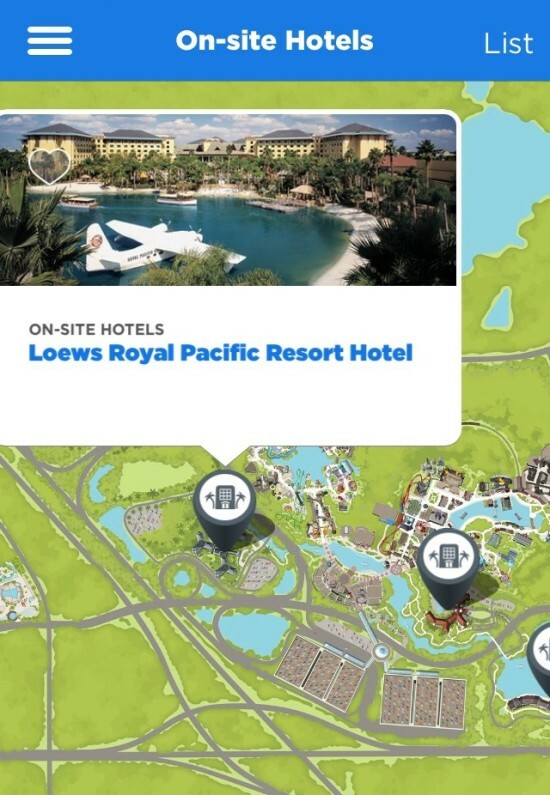 For example, once you are inside the resort, you can select the “Guide Me” function when you are viewing a ride, and it will give you walking directions from your current location. 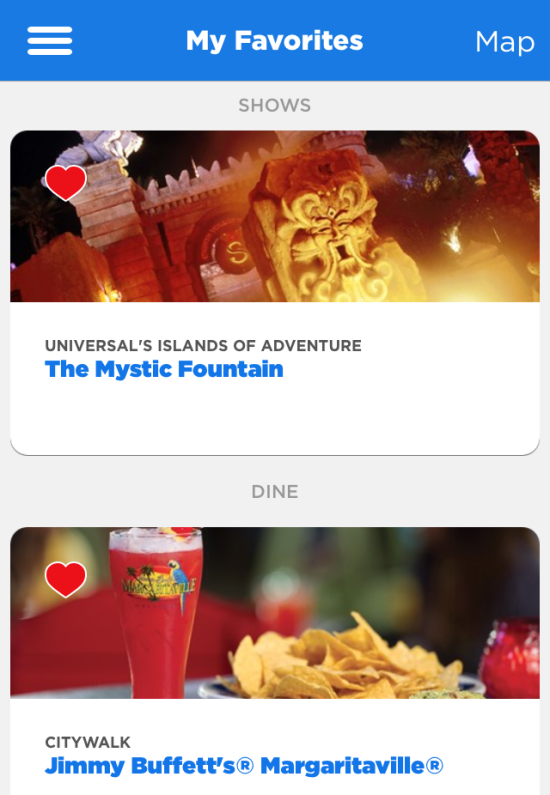 Along the bottom of the screen you will find three simple options: “rides,” “shows,” and “dining.” Then, along the side, there is a menu that can be expanded that contains a lot more options. Let’s run down the list of what each of these does. This is pretty self-explanatory. This will bring you back to the home page, where you can access the resort map and the three main options of rides, shows, and dining. Anytime you view a specific ride, show, or dining location, you can touch the heart in the corner of the screen and mark it as a favorite. 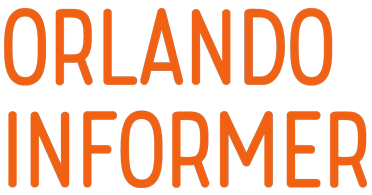 This function is helpful when you are planning your trip and want to perhaps make your “My Favorites” a collection of rides, shows, and restaurants that you know you definitely want to experience on your visit. For frequent visitors, this function helps mark your own individual collection of past favorites. And when checking wait times, having a list of favorites will make it easy to quickly know the wait times of your favorite rides. Occasionally, Universal will deploy relevant messages (such as in-park concerts) and more to your device. Universal’s Parking Structure is huge. You can use this function to take a picture of the sign that labels the section and row where you parked. 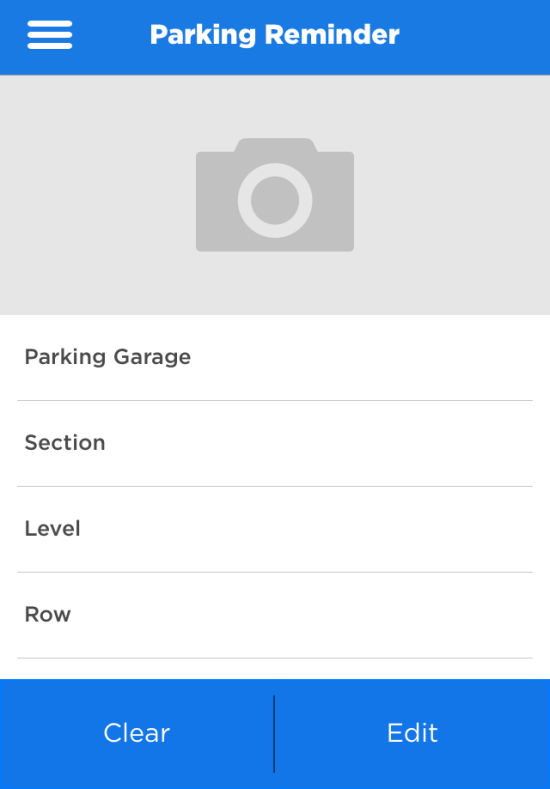 There’s even a space to jot down your parking section, level, and row, to help you remember. You must enter the information in order. The first selection is “Parking Garage,” and you must choose either North or South. The challenge here is that most people do not know which garage is which. My advice is to just pick one and take a look at which sections are in it; you should be able to tell which is which right away. If you picked the incorrect garage, simply switch to the other one. 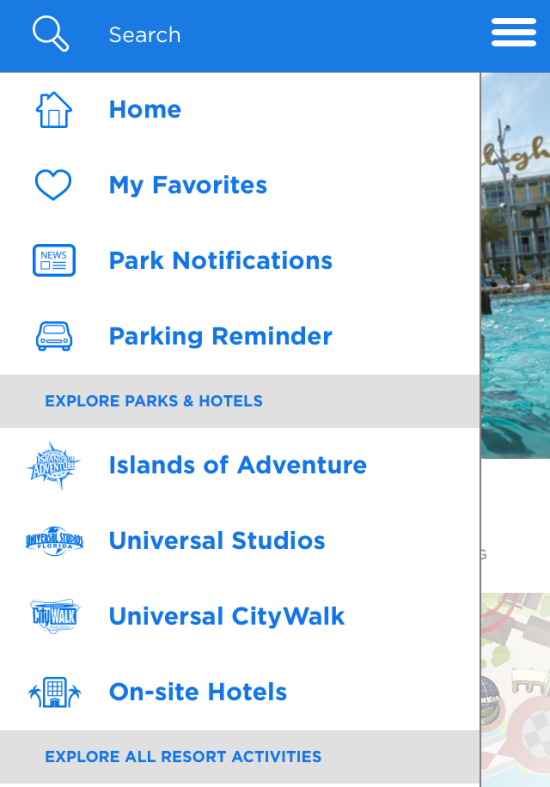 These are the first options under the “Explore Parks & Hotels” header of the side menu. 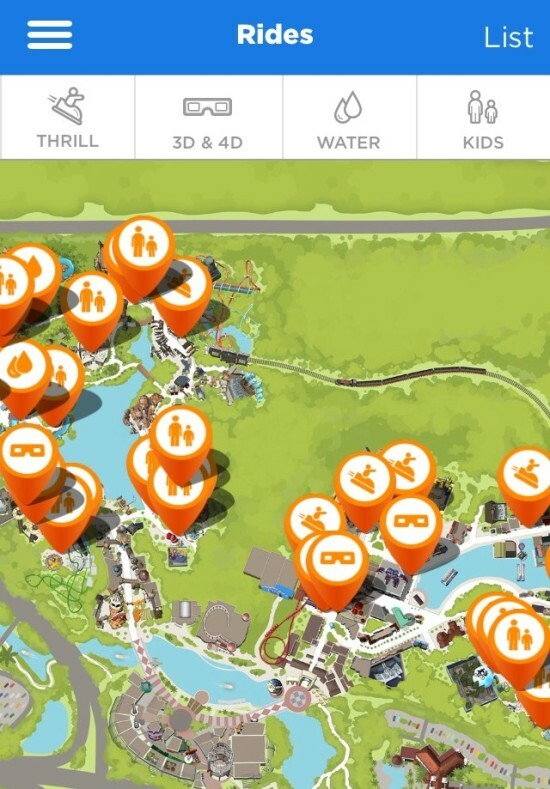 Upon selecting each park, a map will open up. 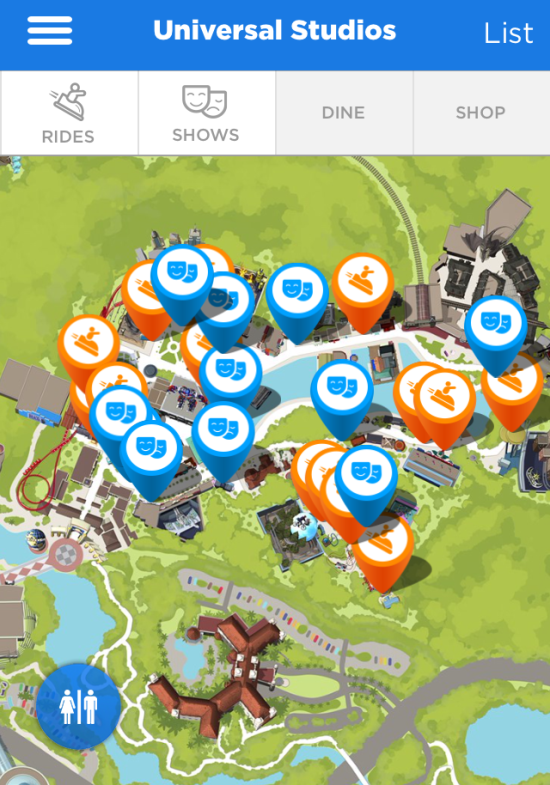 Initially, the map will display icons that show the location of rides, but you can also select “shows, “dine,” and “shop” along the top. These selections can be displayed all at once (by selecting multiple categories) or one at a time, which can be accomplished by deselecting the other categories at the top. There is also a restroom icon at the bottom of the map. This is just like the categories at the top and will display in addition to any other subsets you have already selected. There is one icon for regular restrooms and another which shows three people, indicating a companion restroom. You can also zoom in on the map, which will be necessary to get a better sense of the exact location of the item in which you are interested. The details on the maps, once you zoom in, are fun to look at, as well. 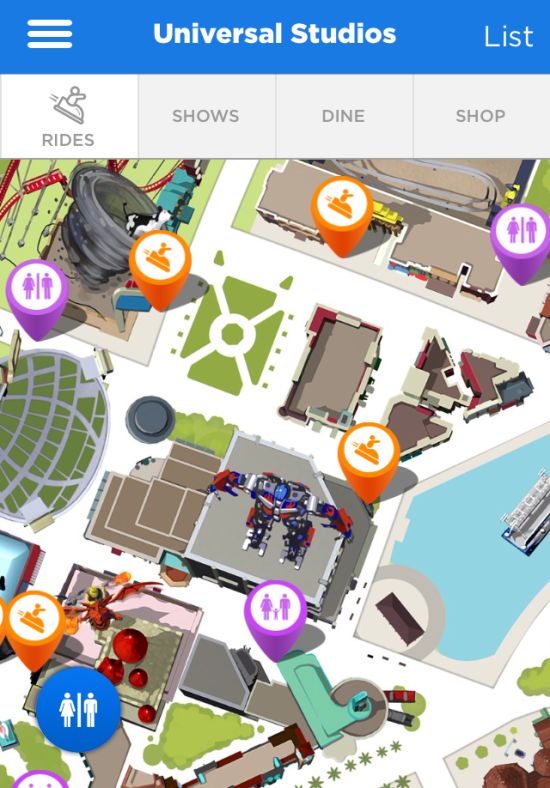 When you tap an icon, you can then view more detailed information about the ride, show, dining option, or store it represents. For the rides, for example, it will show you if Express Pass is accepted, if there is a single-rider line, and child swap information, as well as height requirements, accessibility information, and info for guests with hearing or visual impairments. To view this information, click the drop-down arrow under the blue circular icons. This section opens up a similar map. The categories here are “entertainment,” “dine,” and “shop,” and the restroom function makes a return appearance, as well. 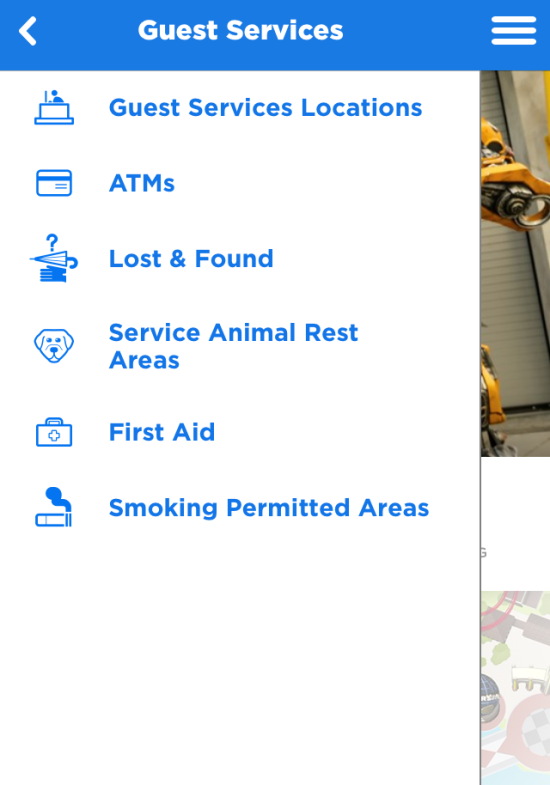 These categories work in exactly the same way as those on the park maps – the more you select, the more icons will show, and in order to remove a certain category, you must touch it to deselect it. This selection will also display a map showing the five on-site hotels. You can view the hotels using the “list” function at the top right corner. Once you’ve selected the hotel of your choice, you can scroll through information about it, including features, dining options, contact information, and directions. As with all the other options under the “Explore All Resort Activities” header, the rides can be viewed as a list, which will be in alphabetical order and will display in whatever order you initially selected the categories. The “shopping” option functions the exact same way: on a map, all of the resort’s stores will be displayed. The only difference here is that they aren’t broken down into different categories, so you’ll need to zoom in in order to view the locations better. You can also view “shopping” as a list, which will be in alphabetical order. 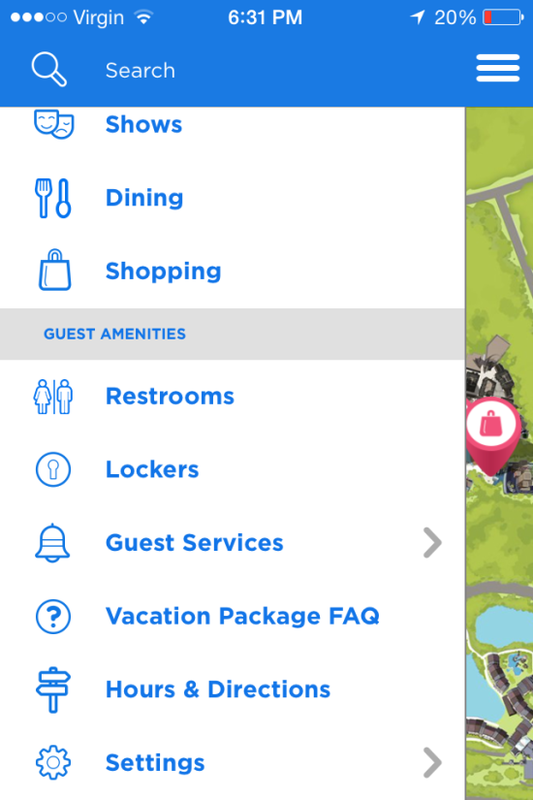 “Restrooms” is the first option under “Guest Amenities,” which is the side menu’s final header. Just as with the other options, a map of the entire Universal Orlando Resort will open, and you can select either restrooms or family restrooms (or view them both at the same time). A map of the entire Universal Orlando Resort will open. You can select either rental lockers or ride lockers, or view them both at the same time. You can not only view today’s hours of operations for the three parks and CityWalk, but also call up a calendar for the whole month (and year). The “Directions” function gives the address and GPS coordinates of Universal Orlando. You can also select to use Apple or Google Maps straight from the app. All in all, this new official Universal Orlando app is a big improvement over its predecessor, and the free (and expanded) resort-wide wifi is certainly a worthy companion.